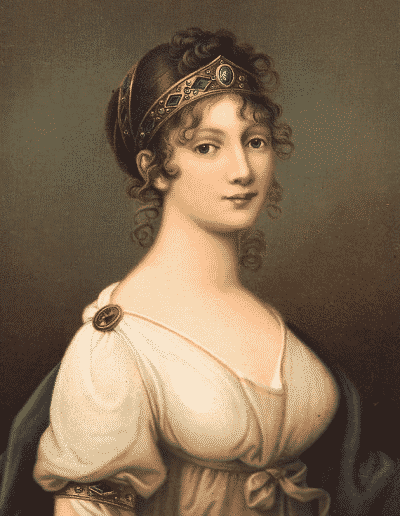 Queen Louise of Prussia in Typical Neoclassical Dress with Diadem, Armlet and Shoulder Brooch. By Jozef Maria Grassi, 1802. Jewelry from the late 1700’s and early 1800’s can be characterized by typical shapes and ornamentation which are highly inspired by the classical themes of ancient Greece and ancient Rome. Roughly we can place the neoclassical era in the 1760 to 1830 timeframe, with some variation in motifs during the evolution of the style. Although in Great Britain it started around 1720 in architecture, we find jewelry in this fashion only from about 1760-1780. The sympathizers of The Enlightenment movement started to rebel against the exorbitant life styles at the courts, especially in France which eventually led to the French Revolution in 1789. People wanted a new fashion to reflect their new morals and philosophy and found that in the examples of the ancient Greek and Roman works of art. During a “Grande Tour” through Europe, young men were introduced to the ancient examples of the Hellenistic period and the time of the twelve Caesars and brought that knowledge back home. Ancient Greek textbooks were translated and a new fashion emerged rapidly. Earlier in the 18th century, the fashion revolved primarily around the courts and the well-to-do with their powdered wigs and extravagant dresses of many layers of heavy fabrics. Around 1760 the clothing fashion became less tight fitted and was created from more lighter materials. Eventually towards the end of the 1700’s the materials used were so light that they started to cling to the body of the women, showing their feminine contours which was accentuated by a waistline which moved up to just below the bosom. These dresses were usually white or in another light toned color, resembling ancient statues found in Greece and Italy – although the original statues were multi-colored. The hair was worn bound at the back of the heads, leaving the ears and the deep necklines free. All this called for a new style of jewelry as the earlier examples did not go well with the new dresses and they were undesirable reminders of the ancient regimes of the previous period. The Enlightenment called for new themes and much of the old jewelry was dismantled and refitted, or sold during these turbulent times of wars and political change. As there were at the time no good examples of jewelry worn by Greek and Roman women – The Priam’s treasure of Troy was unearthed until the 1870’s by Schliemann – , a jewelry style was invented by jewelers in a way which they thought would have been worn in ancient times. Motifs were taken from architecture as Roman ruins and Greek temples, but also from the excavations in Pompeii and Herculaneum and they were incorporated into jewelry of low relief, often even very flat. At the initial stage of the new fashion, the wearing of jewelry was kept at a minimum – or not worn at all – to establish the purest “Helen of Troy” look as possible, but later it became more acceptable to wear them in modesty. The free ears invited the ornamentation of long earrings while the deep breast line was very suitable for large necklaces worn close to the neck, as colliers en esclavage. Another style of wearing necklaces was in the form of very long chains which were worn loosely around the shoulders. The main difference between the neoclassical period and the Renaissance was that the latter era was a style for the wealthy, while the neoclassicism was inspired by and created for the people. While there were strict societal rules in the early part of the 18th century on what should be worn and who could wear it – there were even regulations as late as in the 17th century which prohibited the wearing of precious metals by people other than the high society – the new style was a style for and of the people. Or at least for those who could afford it. One could see a Queen dressed as a Roman goddess, but a commoner might wear the same design as well and the boundaries between the classes gradually evolved in fashion as the spirit of the day was strongly influenced by the equality between all men. The upper circles – always a bit more equal than others – did however not waste time in creating new fashion rules which they strongly obeyed. For different times of the day, a different outfit was chosen and one can put them roughly into two categories; the “petite tenue” and the “grande tenue”. A petite tenue was the simplest form and usually, no jewelry was worn during certain times of the days, usually mornings and afternoons. During official ceremonies, the ladies of the elite started to wear precious jewelry again which also incorporated diamonds as they were best suited in the candlelight lit rooms. The jewelry of these grande tenues was highly geometrical and generally had a 2-dimensional appearance and often worn in parures. The naked arms gave room for the fashion of wearing armlets on the upper arm as an Amazon. These were always worn in pairs, as were rigid bracelets. This is especially true for the years following the French Directoire and the French empire. During the years of the revolution itself, there was not a good market for jewelry due to financial costs to fight the many European wars and counter-revolutionists. The few jewelry items from that period usually hold pictorials of typical revolutionary motif as guillotines and portraits of revolutionary heroes. After Napoleon Bonaparte became Consul of France – and later emperor – jewelry became more abundantly worn and jewelry houses found a new client in the prospering elite of French society. The “noble simplicity” remained in fashion, yet simplicity became expensive. The conquest of Italy in 1796 and the successful Egyptian campaign in 1798 brought many new themes in fashion. From Italy came the love of Caesarian motifs associated with victory and triumph, cameos became the craze as Napoleon himself was grabbed by the beauty of the ancient and renaissance carvings. Micro mosaics started to reappear in jewelry, at first gradually and later in large numbers. From Egypt came inspiration in the form of sphinxes, pyramids, and scarabs. In countries outside France, the fashion was more plain, mainly due to different taste but also because of the French occupation of those countries which forced them to pay large amounts of indemnities, leaving them financially crippled. Notwithstanding all hostilities, Paris remained the fashion capital and other countries still drew inspiration from the latests fashions which were in vogue there. The new fashion did not appeal to everyone and those with a more traditional taste continued to wear fashion as in the earlier parts of the 18th century. Not every woman could gracefully wear the thin muslin dresses which clinged to the skin and many caricatures were drawn to ridicule this fashion. Conservative ideas remained outside the main stream of fashion, especially at courts where they did not identify with the idea of equality for all. The Louis Seize bow-knot motif remained its popularity well into the 19th century. During the late 1700’s the industrial revolution started and workshops transformed from serving the local communities to large scale export companies. Especially smiths from the town of Hanau in Germany took orders from international jewelry houses according to provided designs. As Hanau was a “free town” where no guild rules were applicable, they did not just export jewelry to several European commissioners but they also didn’t need to obey to any hallmarking rules – and even stamped pseudo hallmarks on the items. The latter is what makes it virtually impossible to determine the origin of these jewelry items, unless documentation is present in the form of design drawings in the archives or the obvious hallmarking clues that were indexed from studies that started on that subject as of the late 19th century. Due to the 18th century enlightenment spirit and the expansion urges of Napoleon Bonaparte, the guild system was officially abolished around 1797 and gold smithing became a free profession. This change was not accepted without resistance and many guilds were still in existence well into the 19th century, yet with less influence. As a result of this homogenization there was the obvious trade off in the form of a decline in quality. The neoclassical period hosted several styles which are loosely related to the philosophical ideas of The Enlightenment and general shapes used in jewelry. Around 1770 the style in France changed under the influence of Queen Marie Antoinette who herself was a supporter of The Enlightenment. Although still very much a court style, the fashion slowly started to change towards the more Greek look which became so popular later. Evening dresses for formal wear were still very tight bodices with wigs, yet Marie Antoinette is also often painted in more casual dresses with a higher waistline, open necklines, and loose hair. Diamonds and pearls were still used in large numbers. The style is named after King Louis XVI (seize) of France and lasted until around 1790 but was kept alive in the 19th century by those with a more conservative taste in jewelry. Sometimes it is referred to as the “Marie Antoinette” style as she was the catalyst of this fashion. From around 1760 Robert Adam introduced a more classical style in architecture and interiors in England which also was adopted in jewelry. There was a high tendency towards geometrical designs in a low relief with many classical inspired, redesigned, ornaments which were taken from ancient buildings. His designs showed much symmetry in design and among his favorite themes were fluted pilasters, rams heads, draped festoons, flower wreaths and oval pateras. The decoration was never abundant and the overall shape of an object was never dominated by the, sparsely used, ornaments. In the German Kingdoms, the fashion leaned more towards examples the ideas of the ancient Greek society, much inspired by Johann Joachim Winckelmann who idolized the Greek society in his writings and translations of ancient Greek texts. 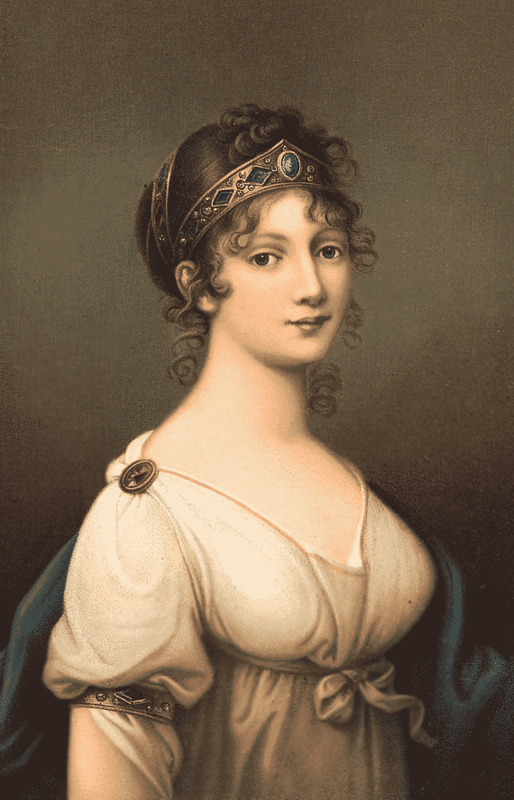 Especially the beautiful Prussian Queen Louise was one of the trendsetters of this Greek fashion. The empire style emerged around 1800 in France and is the court style of Napoleon Bonaparte. It celebrates his success as a general of the revolution as well as his absolute rule as the emperor of France and the newly besieged surrounding countries. Inspiration was drawn largely from Cesarean Rome and Pharaoh Egypt. From all styles – apart from the Louis Seize style – this one was the most abundant and decorative one. The regency style of Great Britain is synchronous to the empire in France and roughly falls between 1795 and 1830, following the Adam style and preceding the Victorian age. This period encompasses the reign of Kings George III and George IV (Prince Regent from 1811 to 1820) and can be categorized as late Georgian. Especially the Prince Regent (the later King) induced this ornamental language in Great Britain with its own interpretations of the empire style. From about 1815 there was a simplified empire style in Germany with a strong emphasis on clear lines and deprived of much decoration as was seen in the English regency period. The motifs used in the late 18th and early 19th century are predominantly classical with the ornamental language initially taken from architectural decorations. There was a high level of symmetry in most years of the neoclassical period and the relief was low, more than often even flat. Popular motives were rosettes, festoons, half fluted pillars, vases, urns, ribbon bows, hearts, portraits and snakes (ouroboros). Later these were expanded with palmettes, sphinxes, trophies, meanders, wine and acanthus leaves as well as crescent moon and star brooches. From about 1750 the silhouette became a popular fashion of creating portraits. The main shapes used were geometric ovals, navettes (marquises), rectangles, polygons as elongated 8-sided cartouches, shields, and rhomboids. A special motif was two handshaking hands, which were a symbol of brotherhood and these were especially popular to indicate the convent against Napoleon. The new found ideals of the late 18th century did not permit much use of expensive materials as diamonds and pearls, although they were still used on occasion. There was a larger emphasis on, relatively, cheaper gemstones as aquamarine, amethyst, chalcedony, turquoise, coral, amber, lapis lazuli and garnets. Costume jewelry made from alternative materials as pinchbeck and tombak, set with strass was also highly fashionable. High demand for jewelry after 1800 changed the way in which jewelers ran their businesses and instead of having them created in their own workshops, they were ordered from large manufacturing companies as those in Hanau, Germany. The alloys used began to shift from dominantly 18 ct to lower percentages of gold as 14 and 8 ct. From 1796 onward cameos became very popular and Napoleon even started a gem carving school to satisfy his hunger for them. There was such a high demand for these carved gemstones – which were mainly in agates – that in the early 19th century people started to carve them in shells, which was a cheaper material and much easier to work in. The workshops in Torre del Grecco, Italy (near Naples) comprised the main center for these shell carvings, as well as for corals. Many cameos were forged from other materials as glass (“Tassies“), porcelain and even gypsum. Cameo doublets also were not uncommon. The themes of these cameos were almost always derived from classical mythology and portraits. Dating them can be extremely difficult as these cameos were carved after the ancient examples with great precision and usually the frames provide for the best clues, although they could have been refitted later – as they often were. By the end of the 18th century mosaics started to appear in jewelry and this became very fashionable from around 1810. The high demand of these inlays caused an overall decrease in workmanship and by the 1840’s there was little interest in them anymore, until Castellani started to restore the reputation of these little works of art around 1850. Other novelties were inlays of hair, paper, paper mache, ivory (with miniature paintings), verre églomisé and blue glass. Also marcasite and cut steel were often used. Most of these were worked in memory jewelry to commemorate a loved one, living or dead. The created miniatures with these materials were usually set under a glass or rock crystal cover to protect the delicate work. For the main mourning period only black materials were used as yet and French yet (a black glass). A special place among the replacement materials of this era takes iron work, or Fer de Berlin as it is most commonly referred to. Although it has been used earlier it became a novelty from around 1803. It initially was a German type of jewelry which became fashionable across Europe after the defeat of Napoleon in 1815. Due to the high costs of gold, many items were worked in delicate filigree work. Open settings for diamonds were not new – Cellini already described it in the 16th century – but from 1800 onward there came more and more jewelry items with a jour set diamonds which were previously mainly set in closed backs, often foiled. 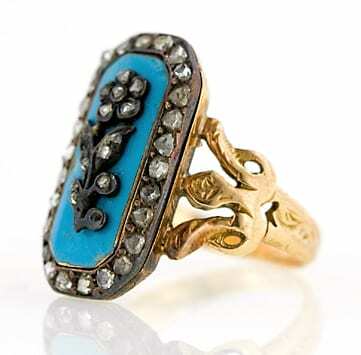 Typical Turquoise Enamel and Diamond Neoclassical Ring. Note the Use of Both Yellow Gold and Silver as Well as the Shank Spreading Out into 3 Towards the Head. Usually rings were comprised of a large head in the typical polygon, oval and navette shapes with various inlays as a large center stone with a modestly decorated rim – sometimes with diamonds, strass, cut steel, marcasite or seed pearls – but mainly the inlays were created from novelty materials as ivory miniatures, glass, cameos, hair works and even paper. New in this era was that the heads of the ring (which held the inlays) had a concave shape at the base to follow the rounded shape of the finger. The shanks of these rings were small at the base and widened towards the head. Sometimes these inlays could be replaced by other inlays of different gemstones which were provided by the maker, the so-called “mineralogical rings”. Sometimes the shank was not from metal but was formed from strands of small pearls or hair. Another type of ring was of a flat design as a modern-day wedding band with inscriptions or geometric decorations in low relief. Sometimes these were comprised of two rings on top of each other, the outer one could be opened through a hinge and a secret inscription was revealed from the inner ring. The giardinetto rings which evolved in the 17th century remained popular. Greek négligée style dresses bared the arms to the shoulder which invited armlets to be worn. Armlets were generally rigid and of simple, flat design. Usually worn between the shoulder and the elbow, sometimes they were fitted just below the elbow, and armlets were always worn in pairs. Earrings from the early neoclassical period, in particular, the Louis Seize era, were still much decorated with diamonds and pearls. Later, around 1800, these changed into a flat geometrical design, often as 3 motifs below each other and with an s-shaped tension wire to keep it fixated on the ear; the so-called poissardes. The girandole earrings remained in fashion during this period, often set with colored stones as garnets with foiled backs. A type of earrings seen mostly on portraits around the turn of the 19th century are large pearl drops suspended from a round smaller one or a small cluster. Necklaces came in two main types, those worn closely -but not tight – around the neck in the form of en esclavages with their classical depictions in cameos and other reliefs, and secondly, there were long necklaces of flat geometrical links that were loosely worn around the shoulders. Brooches were usually inlayed with cameos, blue glass or enamel, less costly gemstones and sentimental depictions made from ivory miniatures, hair and paper cuttings. These were set in a rim of modest decoration as a chiseled frame or set with seed pearls, paste, cut steel and occasionally diamonds. The pins of these were usually caught by a c-clasp and the pin itself started to extend beyond the dimension of the brooch. Huibers, Jef. Twee eeuwen sieraden. Schoonhoven, The Netherlands: De Vakschool. Liberty, equality and brotherhood. One of the mottos of the French revolution.